The two men traded blows at Broadway and West 94th Street early Wednesday, video shows. UPPER WEST SIDE — An assailant swinging a machete traded blows with a man wielding a metal garbage can on Broadway on Wednesday morning in a dramatic dustup that stopped passersby in their tracks, video shows. A 35-year-old man dressed in red was crossing the street while talking on his cellphone at Broadway and West 94th Street about 6:50 a.m. when Luis Roman, who works for the MTA, drove by but became enraged when he thought the pedestrian wasn't paying attention, an NYPD spokesman said. Roman started arguing with the man in red, but it escalated into a fight, police said. 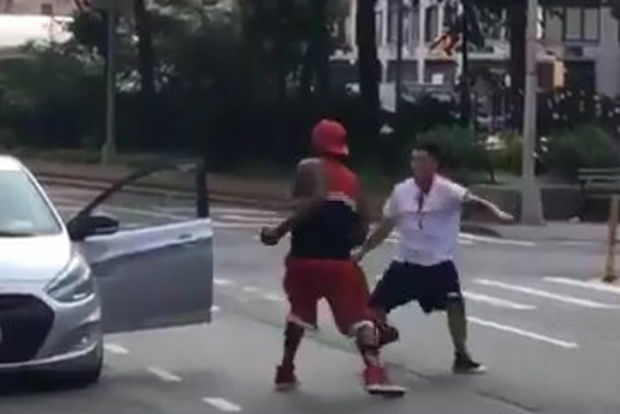 Video of the fracas begins with a man dressed in a red-and-black tank top dragging a trash bin through the intersection toward Roman, who slaps his blade against the sidewalk near Broadway and West 94th Street, according to witness Paul Tena, who shot the video. "My first instinct was to stop my husband and back up before we walked into the fight," Tena said. There is a brief lull in the fracas as Roman and a woman get back in his car, the video shows. But then the man in the tank top tries to open the passenger door, with Roman chasing him back and even hurling his blade, missing his adversary completely but sailing right past Tena. "We weren't rattled, just eager to get out of there," Tena said. Roman appears to have a bleeding neck wound that stains the chest of his white shirt, the video shows. The two men end up in a fistfight in the middle of the street before the nearly two-minute recording stops. "I stopped filming when the fighting ended. The couple drove off and turned right on West 93rd," Tena said. At some point, Roman destroyed the phone belonging to the man in the tank top, police said. Police arrived shortly after and the man in the tank top flagged them down and tried to direct officers after the car, Tena said. Roman ended up doubling back to the scene of the fight and was pulled over by police, he added. Roman, of Belmont, was arrested for assault, criminal mischief, menacing and criminal possession of a weapon, police said. He hadn't been arraigned as of Thursday morning, records show. He's been arrested once before, in 2006, but police records for that are sealed, an NYPD spokesman said. Police said Roman works for the MTA, but didn't know in what capacity. The MTA didn't immediately return a request for comment. One person was treated at Mount Sinai St. Luke's for a "non-critical injury" after the fight, according to an FDNY spokesman.